This post is sponsored by Chop House Steak Burgers but the content and opinions expressed here are my own. This post contains affiliate links. 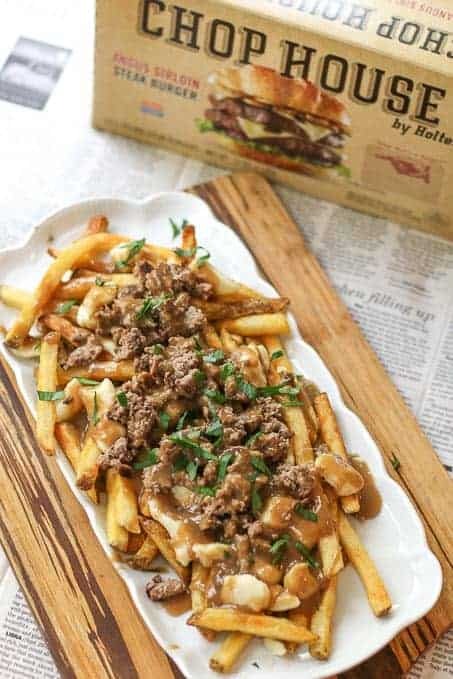 This cheeseburger poutine recipe is made with a delicious homemade brown beer gravy topped with a chopped burger and your favorite cheese curds over crispy fries. The flavor combinations are delicious. It makes the ultimate party starter or appetizer. 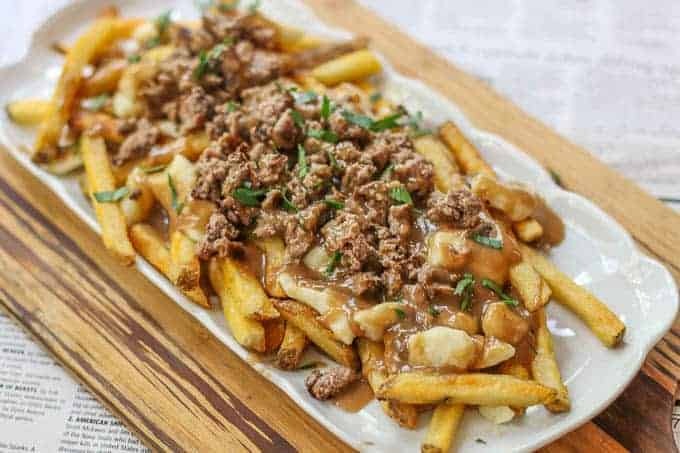 When I first started food blogging, I saw all of these amazing pictures of poutine all over Instagram. I was like, “I have to try this stuff. It looks wicked good!! !” However, poutine just wasn’t a thing to find here at my local restaurants back then. My first opportunity was at a little food truck in Wilmington, NC after an Avett Brothers concert. When I saw it on the menu, I was like, “Load them fries up!” They were as good as they looked. After my first bite, I knew I would have to create a poutine recipe of my own for the blog. Since then, I have had poutine all kinds of ways from simple gravy and cheese, to loads of pulled pork on top, and sometimes the addition of steak. Each of these variations have been scrumptious, therefore it was very logical to assume a juicy, tasty crumbled Chop House Steak Burger would be fantastic on top as well! Chop House Steak Burger’s are a home cook’s dream. They are made with USDA choice meat and are frozen raw. All you have to do is cook them and out comes an AMAZING burger. I am just in love with them. They are so convenient to have handy in the freezer. I just pop them out when I want to eat a juicy, flavorful burger at home. This gravy concoction that you add on top of the fries will rock your world. It add in stout beer to make the flavors really POP. The combination of the gravy, cheese curds, and steak burgers are OH SO GOOD! 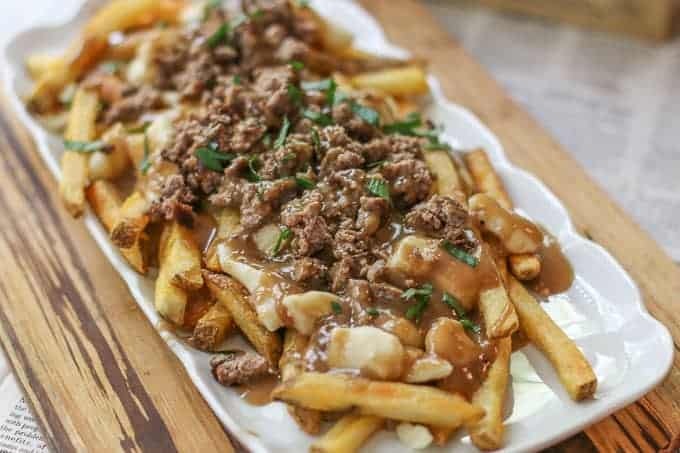 This will be the best Cheeseburger Poutine Recipe you will ever make!!! You may just want to give me a kiss on the cheek after making these to tell me thank you!! *Note- For this poutine recipe, you will want to use plain cheese curds. The gravy won’t mix well with a flavored cheese curd. If you like this recipe, check out: Salisbury Steak, Beer Cheese Dip, and Brie Bacon Burger with Blueberry Chipotle Barbecue Sauce. Mix in flour. Cook on medium heat for 2 minutes, stirring to prevent burning. Slowly whisk in beef broth, making sure to whisk away any lumps. Add beer, balsamic vinegar, and Worcestershire sauce. Stir. Cook, stirring over medium heat until thickened. I only recently discovered Poutine thanks to a visit from Air Canada but I am totally won over! Just gorgeous. And this looks like it’s on another level. YUM. Now this is how you eat french fries! I could eat them like this everyday! Cannot wait to try it out! I am *obsessed* with cheese curds! This looks like SUCH a fantastic dish – a great spin on a traditional burger and fries. YUM! Oh wow! I’ve never had anything like this before but what an awesome idea! I definitely need to make this sometime. Pinning! What a great recipe. I can see why you wanted to recreate it. Actually this is the first time I heard the term poutine. Never let it be said you don’t learn a lot reading recipes and posts. The gravy sounds marvelous over all of the ingredients. YUM! I’ve always heard about poutine but have never actually eaten it. But this, oh I was sold at cheeseburger! We’ll definitely have to try this one! Delicious!! I love this meal because it is such a perfect DIY meal to serve when you have picky eaters! Set it all out and let them pick and choose how to combine it. My family loves it! Thanks so much!! What a delicious recipe! The Chop House steak burgers sound perfect for this. What a yummy way to dress up fries. I have not tried this before but this meal looks so easy to make and it looks delicious too. Oh I love poutine. The first time I ate poutine was in Canada – Love all the meat, fries and sauce. Yum! That sauce is the best part for me. This looks good. 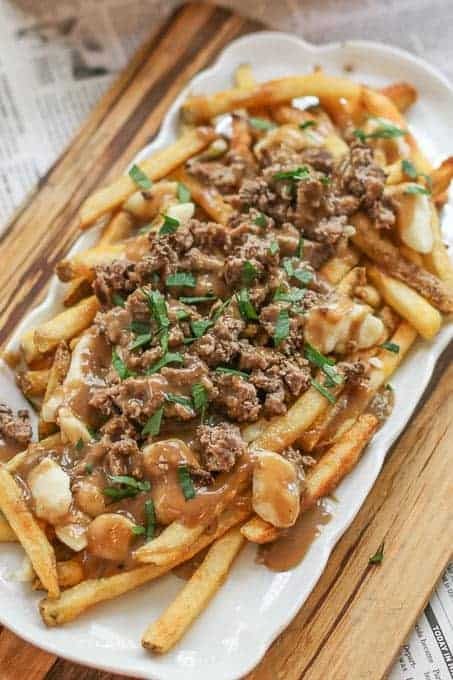 Poutine! My Canadian friends go on and on about it. I gave it a go once and I’ll say, I’m a poutine convert. Your version is a great twist on the classic. Can’t wait to give it a go. Oh my goodness! This looks amazing! I would love to serve this weekend for game day! SO PERFECT! Oddly enough, I have never tried a poutine either! Odd, because how could they not be awesome? I love your addition of the stout, too! Yum! I’ve never tried poutine but I’m a big burger and chips fan that I’m sure I’d love this dish! I first heard about poutine in French class in high school and have been fascinated with it ever since! It looks like you’ve done the dish some serious justice with your take on it – yum! Poutine is my favourite treat! As a Canadian, I am lucky to have it basically everywhere I go. Your gravy sounds delicious! The stout must give it a wonderful flavour. This looks absolutely divine! Your photos are beautiful and just looking at them makes me know what the dish is going to taste like! It looks delicious and comforting!